Postcards for carpet cleaning. Marketing experts for carpet cleaners. Finally! A printer dedicated to the cleaning industry. With 20 plus years as carpet cleaners, we understand the unique challenges of your industry. Our blend of style and insight make you stand out from the crowd with bold, fresh and professional first impressions! We offer a full spectrum of products and services. From postcards and business cards, to brochures and flyers, refrigerator magnets, web pages, trade show banners, door hangers, Yellow Page ads and more. We've even made arrangements with Vacaway to design your very own and completely customized label for their great lineup of consumer spotters. And, if you're looking for an easy way to create your own professional marketing we offer pdQ Postcard marketing templates. Anyone can learn to use them! 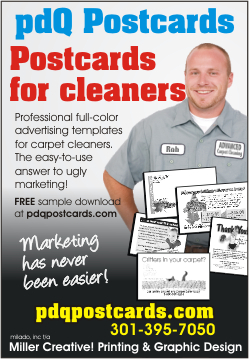 Give us a call anytime at 301-395-7050 or email us wayne@pdqpostcards.com. We'd be glad to discuss your printing and advertising needs. Click here to meet industry professionals with services and products to help grow your business. Want the advantage of a professional designer without the professional designer price? Take a look at pdQ Postcard maketing templates. © Copyright 2004-2009 Milado, Inc. t/a Miller Creative! and its licensors. All rights reserved. For best results don't view in Internet Explorer.